Border Patrol agents are finding success with surveillance balloons that hover high above the Rio Grande and can zoom in on a license plate from miles away, the Valley Morning Star reports. Border Patrol officials said more balloons are possible to keep more eyes in the sky. The balloons are stationed in Rio Grande City, Penitas and near Falfurrias. 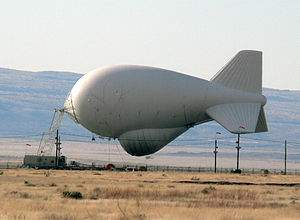 The balloons, called aerostats, are surplus from the Army. Posted: 9/22/14 at 9:59 AM under News Story.